Young Jonathan Blake and his little friend, Horatio Nelson, find their way onto a merchant ship. They overhear the men on board the ship talking about how they are going remove bars of gold from the ship and then scuttle it. Since the ship and all of its cargo was insured by Lloyd's of London, the dishonest men would not only steal the gold but also be paid by Lloyd'sfor the ship and all its cargo. Jonathan sets out to London to tell the insurance company about the dishonest deed. His friend, Horatio Nelson, joins his uncle at sea. Jonathan stays in London and grows up working for Lloyd's of London (and, thankfully, grows up to be Tyrone Power's character). 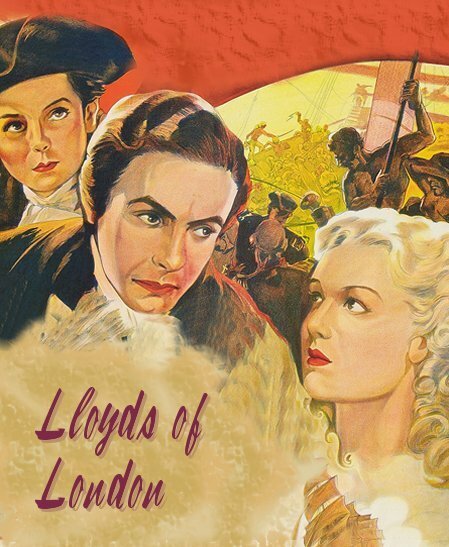 In France, he rescues a rich lady, Lady Elizabeth Stacy, played by Madeleine Carroll. He immediately falls in love with her, not realizing that she is already married. In love with Jonathan is a barmaid, Polly, who has admired him for years. The years pass, and Jonathan becomes very successful in the insurance business. There are various investors who insure different clients .... all kinds of insurance anything from life insurance to sea vessels. When a ship goes down and is declared a total loss, the insurance company loses a lot of money. Jonathan's childhood friend, Horatio, has become Admiral of the British fleet. Lloyd's of London has insured the fleet, and they have made a lot of money from the premiums paid by the fleet. However, things start to go very wrong in the British fight against the French. Ship after ship is declared a total loss, and Jonathan's company is losing a lot of money. The insurance company has to raise their rates to keep up with the heavy losses, but the cost of insurance is becoming too high to even afford insurance. Out of loyalty to England and to his childhood friend, Horatio, Jonathan wants to provide insurance for them at any cost. Lady Elizabeth Stacy, who loves Jonathan and wants to marry him, decides to ask for a divorce from her overbearing husband, Lord Everett Stacy. She promises Lord Everett to give him all of her wealth, in exchange for a divorce, and he agrees. However, before she gets the divorce, she hears that Jonathan has lost so much money in the insurance business and cannot continue to insure the British fleet against losses. She goes to Jonathan and offers him all her money, to keep his business alive a little longer, hoping the tide will turn for the British against the French. Reluctantly, Jonathan accepts, but the British continue to lose ships and, thus, the other investors in the company refuse to sell insurance to them. Jonathan devises a scheme to make it look like the tide had turned in the British fleet's favor. In doing this, he is committing a crime, of course, but he believes the result will be that all the investors will believe that the British fleet is now winning against the French, and it will, once again, be profitable to offer insurance to them. Jonathan is with Lady Stacy, when Lord Stacy, who knows about Jonathan's scheme and is ready to expose the crime, comes in on them. He instantly shoots Jonathan, who is seriously wounded. About the time Jonathan is shot, his friend Horatio Nelson, is seriously wounded in battle. The good news, though, is that Nelson, from his deathbed, directs his fleet to victory. Jonathan lies gravely ill, and the two women who love him... Polly and Lady Elizabeth... stay by his side. They know that the news of the British victory over the French in 1905 at the Battle of Trafalgar will be bittersweet news for Jonathan. On the one hand, the British do get their victory, and Lloyd's of London, who has insured them, because of Jonathan's scheme to show victory before there was victory, will be back making money. On the other hand, his childhood friend, Horatio, didn't live to see the victory. From his bed, Jonathan hears a 21-gun salute, and he fears the very bad news of his friend's death. He walks to the window, looks out, and sees the funeral. It is, for him, a bittersweet victory.